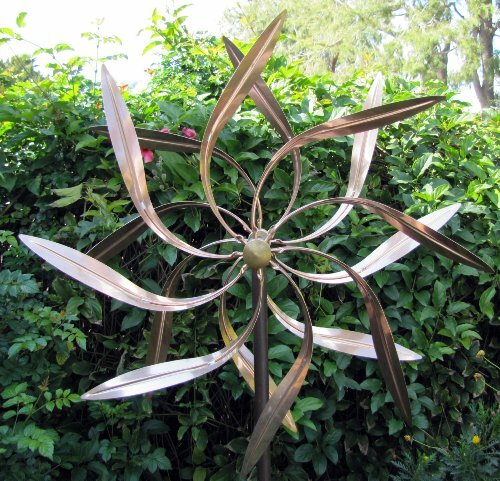 Beautiful kinetic copper wind sculpture with a theme of dancing willow leaves. The willow leaves are positioned so the dual spinners will spin in opposite directions and move with the slightest breeze. This kinetic sculpture can withstand strong winds up to 70 mph. The copper leaves are not coated and will age naturally. The sculpture is entirely weather proof and made to last for decades. Size: Wheel diameter 2 ft, height 6 ft. This beautiful kinetic wind sculpture is made from pure copper with brass hardware. 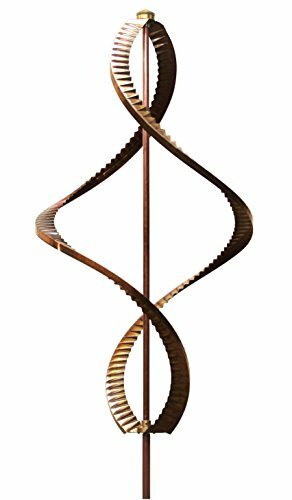 With its heavy duty construction, this kinetic sculpture can withstand strong winds. The wind catchers and arms are not coated and will age naturally. Size: The entire sculpture (above ground portion) is about 7 1/2 ft tall. The spinner head is 22" x 42". Our Illuminarie Dual-Motion Windwheel must be seen to be believed! The kinetic design of the windwheel allows it to rock and rotate around a glow-in-the-dark globe in the center. This beautifully colored globe contains luminescent crystals that absorb the sun's energy by day and release the stored energy by night. Enjoy this unique windwheel anytime of the day or night. 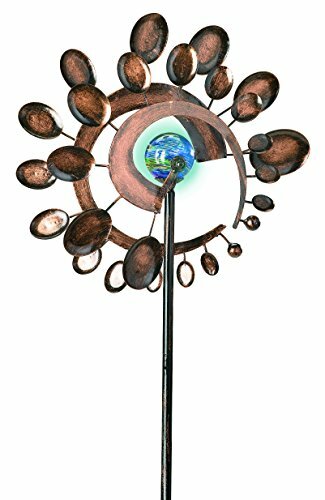 Size: 45"H x 15"L x 5"W.
Beautiful kinetic copper wind sculpture with a theme of dancing willow leaves. The willow leaves are positioned so the dual spinners will spin in opposite directions and move with the slightest breeze. This kinetic sculpture can withstand strong winds up to 70 mph. The copper leaves are not coated and will age naturally. The sculpture is entirely weather proof and made to last for decades. Size: Wheel diameter 2 ft, height 6 ft.